(1) Plantronics SP12 Binaural Noise-Canceling Headset. Plantronics SP12 Binaural Headset S12 Amplifier System. Includes an over-the-head stability for convenience,a noise-canceling microphone for superior sound clarity. Plantronics U10P Cable 27190-01. (1) New Plantronics T10H Single-Line Feature. Plantronics T10H Part Number 49948-01. U10P Cable is not included with Quick Disconnect for HW series Headsets. Model T10H. (1) Refurbished Plantronics HW720. Plantronics HW720 EncorePro Binaural Noise-canceling Headset P/N 78714-101. Model EncorePro HW720. Binaural Style (covering both ears). QD Headset. Connector(s) Plantronics QD Plug. Plantronics EncorePro HW520V is a binaural (double ear) voice tube, over-the-head headset. A visual positioning guides for perfect positioning. (1) Plantronics HW520V EncorePro Binaural Corded. 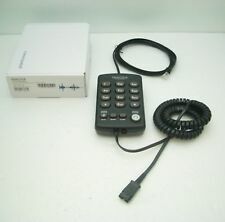 Plantronics HW520V EncorePro Binaural Voice TubeCorded Office Phone Quick-Disconnect Headset P/N 89436-01. (1) New GN Netcom GN9330e Wireless 1.9GHz. It has a noise canceling microphone, digital security encryption and works up to a range of 325 feet. What’s more, it is Wi-Fi friendly, working at 1.9GHz frequency, so it does not interfer with your Wi-Fi Wireless Network. 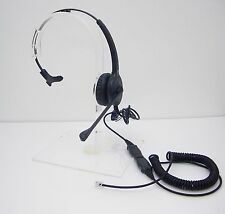 GN Netcom model number Jabra Link 850. compatible with your own GN Netcom Headsets. Jabra Link 850 Audio Processor provides consistent sound clarity, background noise reduction and safe noise levels ensure fewer call interruptions so agents complete more calls – faster. Model GN2125 Duo. Over- The- Head QD Headset. 10-feet cord with QD to RJ-9 modular plug lets you walk away from the phone while still wearing your headset. Cisco 6921, 6941, 6945, 6961, 7931, CP-7940, 7941G, 7942. Plantronics HW301N EncorePro Binaural Noise-canceling Headset P/N 78714-01. (1) Refurbished Plantronics HW301N. Model HW301N. Binaural Style (covering both ears). QD Headset. Connector(s) Plantronics QD Plug. (1) Plantronics Entera HW111N Monaural Noise- Canceling. One New Plantronics Entera HW111N Monaural Noise-Canceling. Plantronics Entera HW111N Monaural Noise-Canceling headset. What's in the box: One Entera HW111N Monaural Noise-Canceling Headset. Jabra GN2120 incorporate a flexible boom which ensures correct microphone positioning, and a noise-canceling microphone that filters out distracting background noise. This model is a monaural headset (you hear through one ear), and the Jabra / GN2125 is binaural (two ears) -- which improves audibility of weak voices and blocks out distracting ambient sounds and nearby voices. (1) GN Netcom Jabra GN2010-ST Monaural SoundTube. GN Netcom GN 2010-ST Monaural SoundTube Headset P/N2013-02-05. 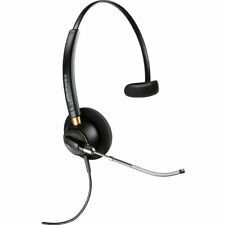 Jabra/GN Netcom 2010 headset are the perfect call center headsets. Two microphone/boom combinations are available, a flex/noise canceling combination and an industry-first flex/SoundTube model. (1) New Plantronics Voyager 500A Bluetooth Office. 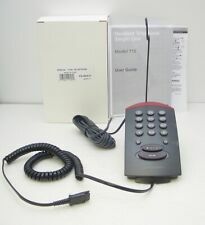 Model Voyager 500A Desk Phone Adapter. Adapter for Plantronics Voyager series and other Bluetooth headsets. Plantronics P/N 67891-02 / 67891-13 / 67891-14. (1) New AddCom ADD800 Monaural Over-The-Head Headsets. AddCom ADD800 Monaural Noise-Canceling Headset with Quick-. This AddCom ADD800 Monaural Noise-Canceling Headset with ADDQD-04 Cable is NOT compatible with Cisco 6921, 6941, 7940, 7960, 7970, 8941, 9951 IP Phones. Plantronics H181 DuoPro headset is the most versatile headset ever! The DuoPro is available in convertible, over-the-head, over-the-ear and now behind-the-head models with noise-canceling microphone or the Plantronics trademark voice tube. (1) AddCom ADD220 Binaural Over-The- Head Noise-Canceling Headset. ADDCOM ADD220 Binaural Headset. MPN ADD220. Model ADD220. AVAYA / Lucent POLYCOM IP300, IP301, IP430, IP450, IP500, IP501, IP600 & IP601 IP Phones. (1) New Plantronics SQD Amplifier RepresentativeNot Available RNA Enabled. Plantronics SQD Rep Not Available (RNA) Enabled Adapter P/N 46799-01. Adapter, SQD, RNA. Model SQD Adapter. ACD Systems. Plantronics H & HW series Headsets. Jabra Link 180 switch is for the traditional Jabra QD stringsd GN Netcom headsets user providing cost effective connectivity between their deskphone and PC. Compatible with any GN Netcom QD Headsets. (1) New Addcom ADD880 Performance Plus II Binaural Over-The- Head Noise-Canceling Headset. ADDCOM ADD880 Binaural Headset. MPN ADD880. Model ADD880. AVAYA / Lucent POLYCOM IP300, IP301, IP430, IP450, IP500, IP501, IP600 & IP601 IP Phones. Spare Fgg.2b.310 Modulr Plug SHS 2907-01. Spare Fgg.2b.310 Modulr Plug SHS 2907-01 P/N 90229-01. SPARE FGG.2B.310 MODULR PLUG SHS 2907-01. Connectors Spare Fgg.2b.310 Modular Plug. (1) Plantronics SHS2907-01 10-feet Cable. Jabra GN1216 QD to RJ9 Straight Cable for Avaya 9600, 1600 series phone P/N 88001-03. There are switchable settings for these Avaya phone models for each headset. Model GN1216. Important - This cord only works with Avaya 9600 and 1600 series phones (Avaya IP 1608, 1616, 9608, 9610, 9611, 9611G, 9620, 9620C, 9620L, 9621, 9630, 9630G, 9640, 9640C, 9641, 9641G, 9650, 9650G, 9650C, 9670). Model H450N. Cisco 6921, 6941, 6945, 6961, 7931, 7940, 7941, 7942, 7945, 7960, 7961, 7962, 7965. Quick Disconnect feature allows you to walk away from the phone while still wearing your headset. Country of Manufacture China. Plantronics CS540, CS510, CS520, Plantronics Savi WO100, Plantronics Savi WO200, Plantronics Savi WO300, Plantronics Savi WO350, Plantronics Savi W740, Plantronics Savi W710, Plantronics Savi W720, Plantronics Savi W730, Plantronics Savi W745. Emotion H800 Headset with U10 Cisco QD Cable. This Emotion H800 Monaural Headset is not compatible with Cisco 7902, 7905, 7906, 7910, 7911, 7912 IP Phones. Model H800. Cisco 6821, 6841, 6861, 6921, 6941, 6945, 6961, 7821, 7841. (1) New AddCom ADD220 Binaural Over-The-Head Noise-Canceling Headset. ADDCOM ADD220 Binaural Noise-Canceling Headset. MPN ADD220. Model ADD220. Cisco 8941, 8945, 8961, 9951, 9971 IP Phones. 9951, 9971 IP Phones. MPN H450N / H450-NC. Model H450N. GN Netcom GN 1005143 QD-to-2.5mm QD Cable. Cisco Linksys SPA 303, SPA501G, SPA502G, SPA504G, SPA508G, SPA509G. Quick Disconnect feature allows you to walk away from the phone while still wearing your headset. Plantronics CS540, W740, W745 W440 Earloop/Earbuds kit P/N 84604-01. Spare Fit Kit for the Savi W440, W740, W745, CS540 & WH500. Model Spare Fit Kit. Foam Sleeve Fit Kit. Key Features. Tone dialing only. Over-The-Head Headset. Extension Jack. Clear Sound quality. complete with. UPC Does not apply. Last Number Redial Button. (1) New Addcom ADD880 Performance Plus II Binaural. ADDCOM ADD880 Binaural Headset. Model ADD880. MPN ADD880. Cisco 8941, 8945, 8961, 9951, 9971 IP Phones. Cisco 6921, 6941, 6945, 6961, 7931G, 7940, 7940G, 7941, 7941G. Plantronics CS540, CS510, CS520, CS530, Plantronics Savi WO100, Plantronics Savi WO200, Plantronics Savi WO300, Plantronics Savi WO350, Plantronics Savi W740, Plantronics Savi W710, Plantronics Savi W720, Plantronics Savi W730, Plantronics Savi W745. (1) Plantronics H91N Encore Monaural Over-The-Head. Plantronics H91N Encore Monaural Noise-Canceling Headset P/N 43465-01. Lightweight over-the-head single earpiece design for comfortable extended-wear use. Connects to single or multi-line stringsd phones. (1)Plantronics A20 Headset Amplifier Deck. Plantronics A20 Headset Amplifier Deck P/N 44900-01. Quick Disconnect coil cable connects to all Plantronics H-series headsets. AddCom ADD700 Monaural Over-The-Head Noise- Canceling Headset. 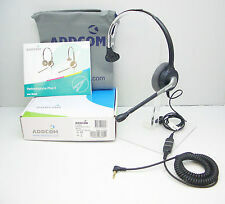 AddCom ADD700 Monaural Headset ADDQD-02 Cable. The AddCom ADD700 Monaural Noise-Canceling Headset with 10-feet ADDQD-02 coiled cord directly connecting to Plantronics M10, M12, M22 & MX10 VISTA Universal Modular Adapter. Plantronics Savi W710/A, a wireless headset system that connects to multiple devices but allows you to manage all calls from a single headset. Users can also listen to any PC-based audio including music players, streaming audio and video, webinars and podcasts with Plantronics W710. (1) Plantronics HW261 Polaris Binaural Over-The-Head Voice. Plantronics HW261 Binaural Voice Tube Headset with. Plantronics HW261 Polaris binaural headsets require no amplifier! (1) U10P 10- feet Polaris QD coiled cable. Model GN2000 Duo Noise Canceling Narrow Band. 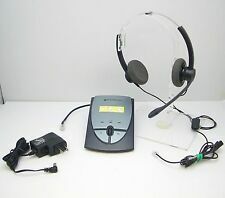 (1) Jabra / GN Netcom GN2025-NC Noise Canceling Binaural Headset. It requires a Jabra Link 860 Amplifier which is not included. Requires a Jabra Link 850 amplifier (or GN1200 SmartCord) depending on your phone. Armor P/N AROLIS. MPN AROLIS. Diminutive design is discreet and unobtrusive. It has a bright red indicator light and is small enough to mount almost anywhere. Bright red indicator light informs others you are on a call.